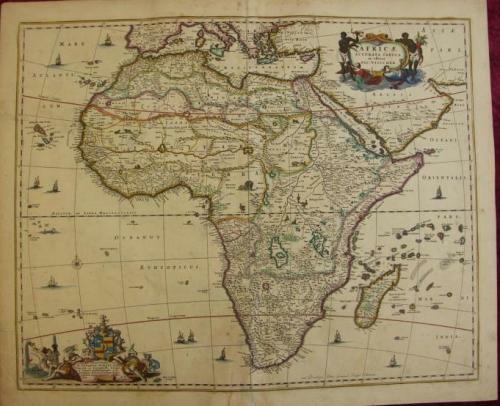 SOLD Africae Accurata Tabula ex officina..
An elegant and large map of Africa with a wealth of detail. The map is in good condition with only a few small areas with paper loss (repaired - very light patches when you hold it up to the light - but these do not show up just looking at the front of the map. ). The "E" of ETHIOPIA is missing (nowhere near present day Ethiopia, interestingly) and the middle fold is verso repaired. There is also a repaired tear (app. 18 cm) in the left half of the leaf. There are also a few other places where the paper is thin These faults are accounted for in the price. Overall very presentable.